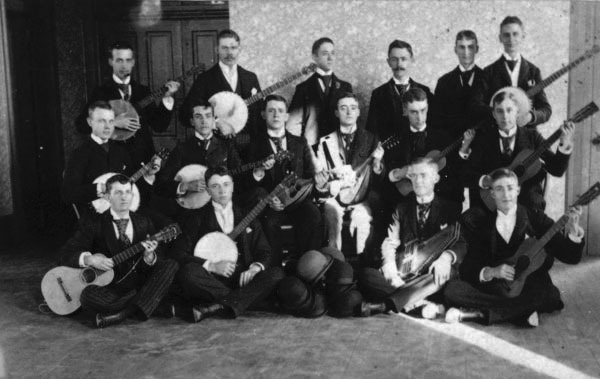 Description: Group of young men identified as “The Grasshopper Glee & Banjo Club” posed with stringed instruments including guitar, mandolin, banjo, and autoharp. Keywords: Organizations, clubs and groups; people; Wichita; music. Description: Wichita Country Club, located in College Hill at the corner of English and Hammond Drive. 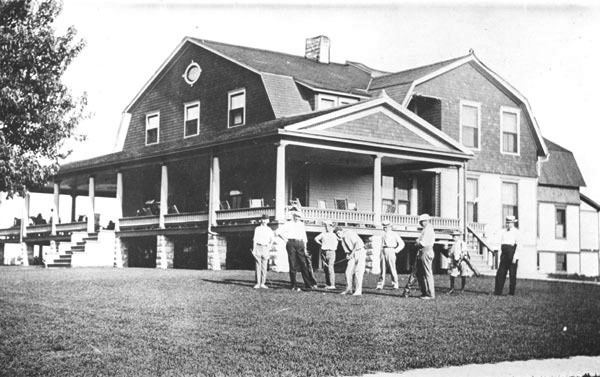 Some men are practicing golf on the lawn. Keywords: Arts and entertainment; organizations, clubs and groups; people; children; sports and recreation; porch; residence; golf. Description: Portrait of Modern Woodmen of America, Wichita West Side Camp No. 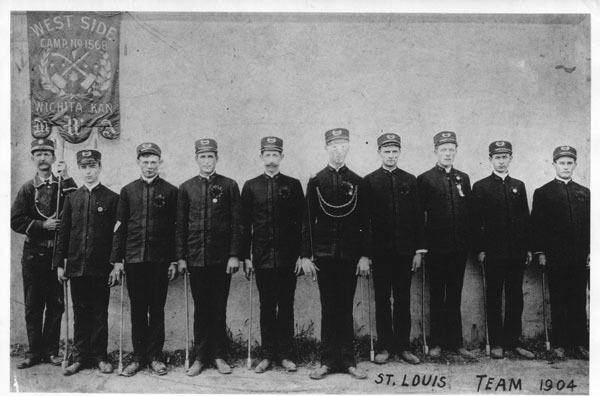 1568, St. Louis Team of 1904; the men are in uniforms and hold axes and a team banner. Keywords: Wichita; people; organizations, clubs and groups; Modern Woodmen of America; west side; teams. 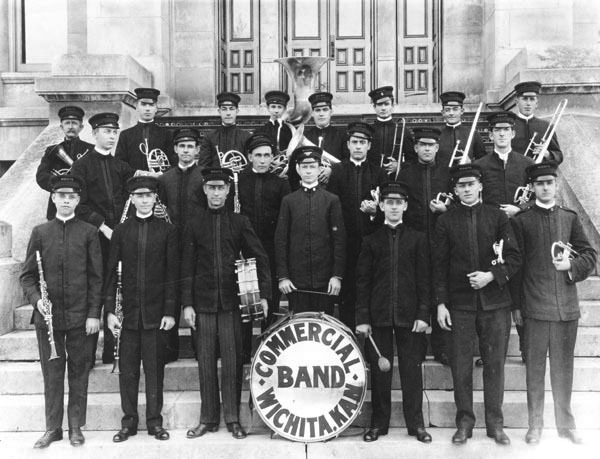 Description: Commercial Band of Wichita, Kansas. Photo was taken in front of the Sedgwick County Courthouse, northeast corner of Central and Main. Keywords: Arts and entertainment; people; organizations, clubs and groups; uniform; instruments. Description: Interior of public school classroom, possibly Washington School, which was located at Cleveland and Third Streets. 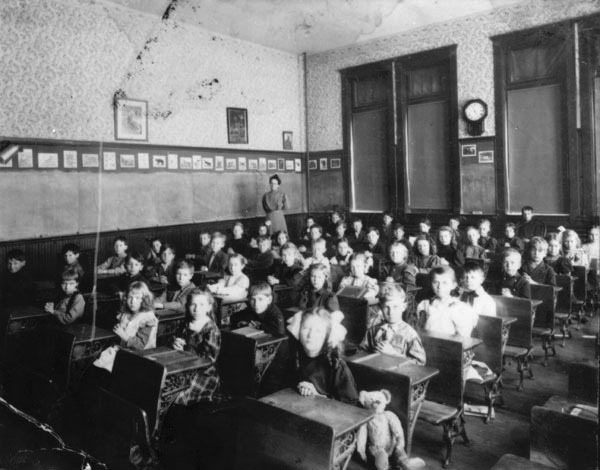 The students are sitting with hands folded on their desks; the girl in the foreground has a teddy bear in the seat beside her. Keywords: Education; people; organizations, clubs and groups; teacher; occupation; employment; Wichita. Description: Members of musical band dressed in humorous costumes. 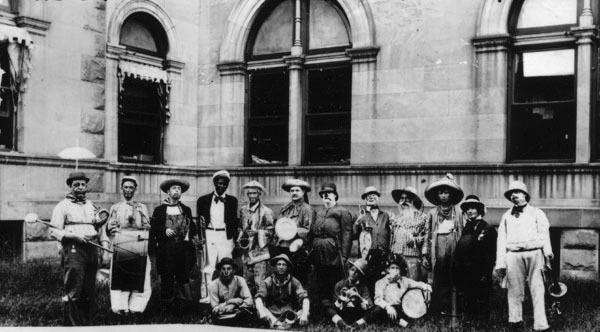 Accompanying notes state the “band had been playing for the Groceryman’s picnic that day.” The group is posed in front of U.S. Post Office building, northwest corner, Market and William Streets. Some are identified (on file). Keywords: Business and industry; people; organizations, clubs and groups; public events; Wichita; clown; instrument; African American. 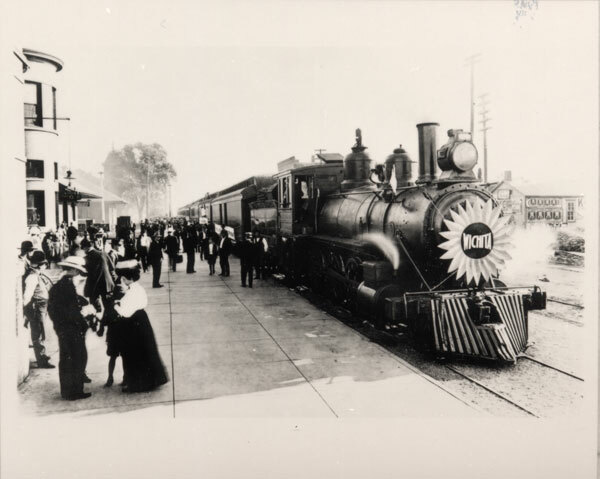 Description: Booster Trip train at the depot of the Missouri Pacific Railway Company, on northwest corner of Douglas Avenue and Wichita Street. Sponsored by the Commercial Club, groups of businessmen traveled to surrounding communities and states to promote commerce. Keywords: Wichita; business and industry; organizations, clubs and groups; public events; people; transportation; railroads; trade; sunflowers. 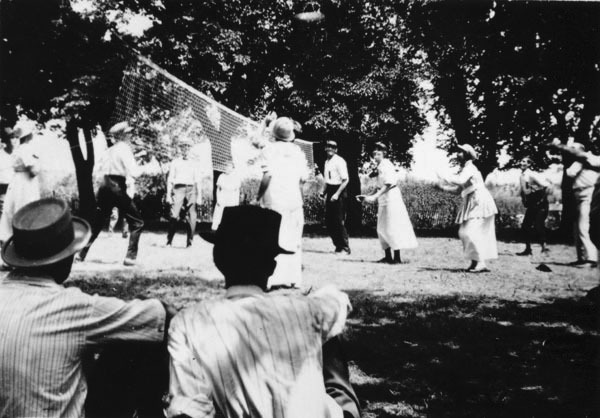 Description: Volleyball game at Coleman Lamp Company employees’ picnic in Linwood Park. Keywords: Business and industry; organizations, clubs and groups; parks; people; sports and recreation; Wichita. 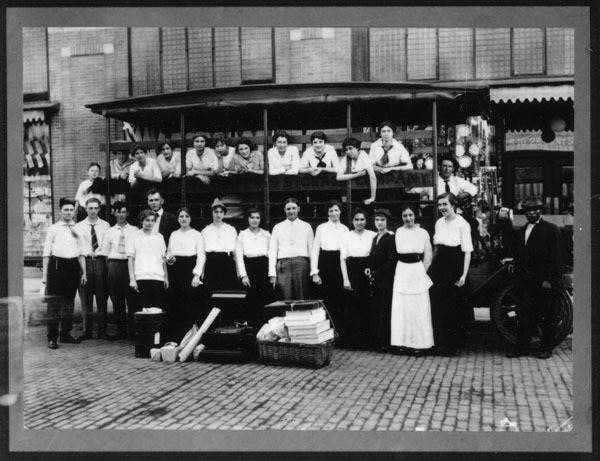 Description: Group of Kress Company employees, preparing to go on an outing. Box lunches and a phonograph record player are among the picnic articles placed on the street. The group is posed in front of the Kress store at 224 East Douglas Avenue. Keywords: Business and industry; people; occupations; employment; transportation; organizations, clubs and groups; sports and recreation; 5 and 10-cent stores; five and dime stores; Merchants Transfer and Storage Company; Wichita.